Dolls scare the hell out of me so this story gave me nightmares. I'm not entirely sure why, but cursed dolls are particularly scary to me. This is the story of an over sized Raggedy Ann doll named Annabelle. Annabelle was a gift given to a young nurse named Donna by her mother. It wasn't long after Annabelle was given to Donna that Donna began to notice Annabelle moved about the apartment on her own. Donna and her roommate, Angie, began to notice that they would leave for work and when they came home the doll would be laying on the bed in a different position. The women started arranging the doll purposely in one position and they would find it with its arms crossed or legs moved. This went on for some time and after a while the doll became more active. It would change rooms. Once, they even found the doll kneeling. This is a position that is impossible for a raggedy anne doll on its own. Over time the doll began to leave messages. The messages were left in pencil on parchment paper. The women had never owned parchment paper so its origin was as mysterious as the messages themselves. The notes usually said "help us" or "help lou". The women began rigging the apartment to check for intruders. They thought that maybe someone was tricking them, but there was no evidence of break ins. One night they came home to find blood on the doll's hand. Finally, the women contacted a medium to talk to the doll. The doll said that she was a little girl who had died on the property who was lonely. After this, the women contacted paranormal experts Ed and Lorraine Warren. The Warrens believed the story about the little girl was trickery to gain sympathy and that Annabelle was really possessed by a demon. This belief was confirmed when Angie's boyfriend was attacked physically by some unseen spirit in the apartment. The attack left a series of deep marks on Lou's chest. After this, a priest was called in to do an exorcism. The exorcism seemed to work and the Warren's offered to take Annabelle home with them. On the way home, Annabelle caused the car to veer off the road almost killing the Warrens. The Warrens dosed the doll in Holly Water and the activity stopped for a time. Soon after, Annabelle began to be active in the Warrens' home and they had to move her to their Occult Museum in Monroe, Connecticut. 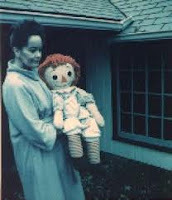 They keep a website that documents their experiences with Annabelle at http://www.edandlorrainwarren.com/. The doll has remained active since its placement in the museum and is even thought to be responsible for some deaths since that time. I can't wait to check out the Warren's web site! Jeez, another creepy doll to be scared of. Who would have ever thought of Raggedy Anne as being evil....hum, makes you think! Very creepy! The Amish do not put faces on there dolls for that reason. Although a faceless doll could be just as creepy as far as I am concerned. So...neither one of these gals was tricking the other and having a laugh about it? And a priest was willing to drop his duties and perform an exorcism on a doll? Do you know how difficult it is for a priest to get permission to perform an exorcism? It can take years to get permission, and psychological and medical evaluations made prior. They don't just show up at your house as a personal favor and perform one. I don't believe a word of this story, and I think the Warrens are just a little guilty of embellishing things to further their career. Not saying Lorraine Warren didn't have 'abilities', but I think they made some stuff up. Justine... I did a post about Robert a while back. He's creepy as hell too. Have you heard about the island of the dolls? Adsila... There really are too many of these creepy dolls. Magikalseason...That is interesting. That would make a great blog post. Robin's Egg... I'm sure you are not the first one to accuse the Warren's of exaggeration to further their careers. Since this story does come from them primarly, it is very easy to question them. There is a wonderful book called "An Exorcist Tells His Tale" written by a priest who spent years performing exorcisms and still actively performs them. I did a book review of it a while back. Most priests won't do an exorcism, but if you find an exorcist like this fellow it seems like he'll exorcise things that whisper of demonic possession. He once performed an exorcism on someone that sounded to me like they simply had severe depression, but he claimed the depression was caused by a demon. Some of his cases made me feel like his exorcisms were too easily performed, but I know my parish priest would very quickly refer me to a local psychiatrist if I went to him asking for a doll exorcism. Yeah, seems a little embellished, but extremely creepy nonetheless. Dolls really are one of the scarier things I know of!